Preserving gaming history is becoming kind of difficult, especially as time goes on and multiple games are lost by being stored on media that deteriorates, with no copies left to properly salvage. 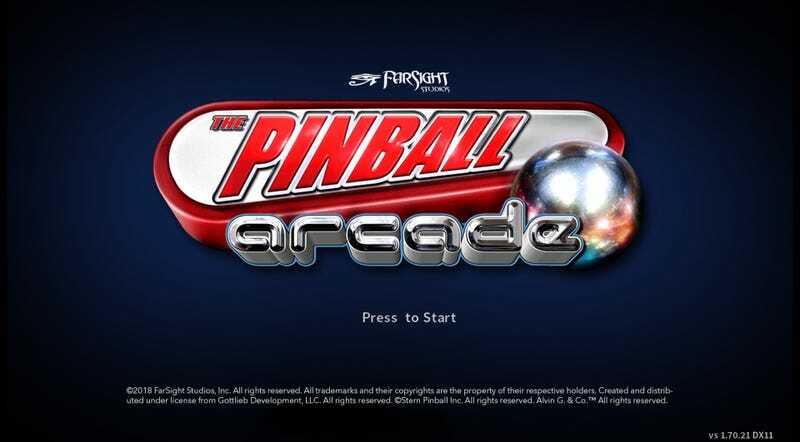 Doubly so when it comes to physical games like pinball as parts manufacturers are growing more scarce. You have some people that are restoring and refreshing tables as best they can, but without a concerted effort, there are tables that will be lost to time. Enter Farsight Studios and Pinball Arcade. By digitizing these tables and emulating them, it allows newfound pinball afictionados (IE: me) to experience these tables without relying on having the physical table. Pinball wasn’t that popular where I am - You can find SOME tables but they are mostly the modern Stern ones (as Stern are the only ones that still manufacture tables, if I recall correctly) such as the AC/DC table. It’s such a shame that the actual Pinball Arcade app is a constant piece of garbage. From its inception, the Dx11 client has had problem after problem - Some of it inherited from the Dx9 client, but others being on its own. Crashes, memory leaks, UI corruption (though this seems to have been fixed), name it, Save data loss, unable to pull save data, the app released with it on PC. Farsight Studios itself has not had a good stroke of luck - in May, it received the news that the Bally/Williams license holders would not renew their agreement, and thus these tables have to be taken off the marketplace for all platforms. You can read more about this here. Worse still (for the customers), these tables could NOT be discounted as per the license agreement. That left Farsight with one job: convince people to buy the tables before they go away forever for their app, without being able to offer discounts. Whoops. Not a good look when you’re losing a good portion of your product. Normally, I’d be all for good riddance to bad product, but the problem is that the work Farsight Studios is doing for these tables is of gaming historical significance. As much as the product itself is bad, for some of these tables it would be impossible for me to play them without a trip to the various Museums of Pinball that have cropped up around the US, and they’re not guaranteed to have some of these tables. A prime example would be Goin’ Nuts, a Gottlieb prototype that was barely produced. Many would rather play tables like Medieval Madness or Terminator 2 as these are fondly remembered tables and I completely understand that people would rather play what’s fun than what’s experimental and eventually deemed bad (I am not a fan of Goin’ Nuts). However, as a piece of gaming history, no matter how infinitesimal, Goin’ Nuts is important and its inclusion in Pinball Arcade helps place other Gottlieb tables in context. The same with Central Park, a 1963 Gottlieb table that, if I recall correctly, is the oldest table included in the app. How historically important is it to gaming? Probably a whole lot more than others. How many people clamored for Central Park’s inclusion in Season 2? Probably not a lot. Still, regardless of what I may bring forth about the app’s stability, how much I crow about its outright baffling implementations of the most basic features such as High Scores (I think half my tables have a score of 8 billion now, including tables I’ve never played) and how much memory leaks occur, I still play it for the historical aspect. A good path to discussion - Favorite pinball table? Least favorite? Or better yet, games you believe need to be historically preserved AND may be endangered?